With the precision Minot rotary microtome, accurate microscopic samples with a thickness of 1 to 40 µm can be prepared. The precision Minot rotary microtome was specifically developed for use in historic laboratories. The precision Minot rotary microtome is handled via a balance wheel, which converts the circular motion into a vertical motion of the sample holder. Due to a high mass of the balance wheel, variations in hardness of the material can thus be evened out. Furthermore, different cutting speeds are avoided, resulting in even sample cuttings. The precision Minot rotary microtome MT.5505 is suitable for soft materials. Additionally, the D-type Microtome knife (up to 30°) and the sample holder (up to 5°) are both adjustable and thereby allow various sample cuttings without having to switch specimens. 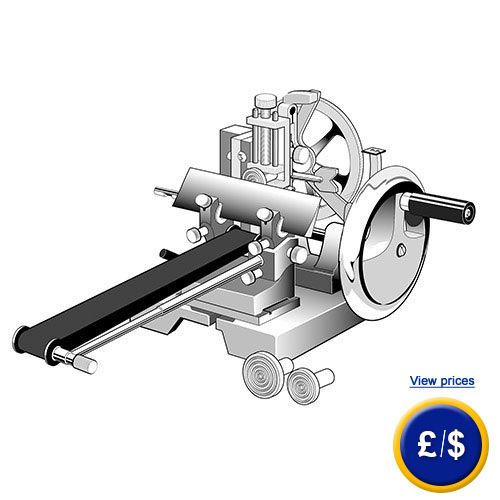 This microtome can cut both single cuttings and cut cores, in case multiple cuttings are cued to a core. The precision Minot rotary microtome is suitable for various types of material and therefore useful in many different areas. Above all, the precision Minot rotary microtome is easy to handle, stable and robust. The precision Minot rotary microtome has a large range of feeds. If there are any questions about the precision minot rotary microtome MT.5505 have a look at the technical specification below or call: UK customers +44(0) 23 809 870 30 / US customers +1-410-387-7703. Our technicians and engineers will gladly advise you in all precision minot rotary microtomes and all products in the field of measuring instruments, regulation and control and scales and balances of PCE Instruments.